Welcome to the portal of Christopher Bridge Cellars and Satori Springs Estate Vineyard, where we encourage appreciation of all the senses while carefully honing the ancient art of making wines of purity, elegance and depth. 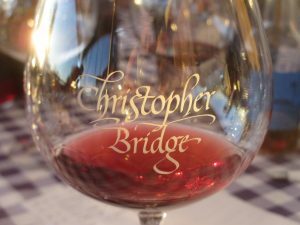 Christopher Bridge focuses on the finest of the cool climate varietals grown in the Willamette Valley region, Pinot Gris and Pinot Noir. What was once known in our family as Westwind Farm has, over the course of more than six decades and three generations in the care of the Carlberg family, emerged as a truly unique place to live and work. Old prune tree orchards have disappeared and, more slowly, the large mounds of wild Evergreen and Himalaya blackberry patches, mostly remembered in the innumerable delicious pies we’ve enjoyed from their abundant, richly flavored fruits. Three treasured old-growth trees provide the keenest landing spots for large birds of prey, while deer, coyotes and the occasional mountain lion still have their domain in the second growth forests here and there. It is a place where “magic” still happens, whether in the surprise discovery of a newborn calf or observing the transformation of a field of brown vine-stalks into a sea of green leaves throughout a new growing-season. For 20 years now, Satori Springs Vineyard has become the focus of this farm. However, we feel that true sustainability and satisfaction in nurturing the land and its entire ecosystem cannot be achieved by monoculture. We therefore strive to be excellent stewards of all that surrounds us here while continuing to grow vines and wines which reflect the Master’s touch. Thank you for taking the time to get to know us and our wines.